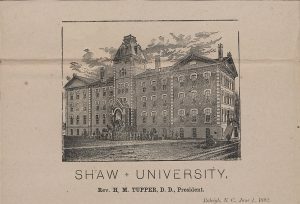 A new batch of materials documenting the history of Shaw University, a historically black liberal arts institution in Raleigh, NC, are now online and available for use at DigitalNC. The materials consist of commencement programs, annual reports, and an admissions flier from the 1890s and early 1900s as well as a program for a missionary training conference held at Shaw University in 1946. The earlier set of documents provides insights into the recruitment efforts, budgetary concerns, and graduation ceremonies of the university. Similarly, the 1946 program documents the results of a teaching partnership between the university and the General Baptist State Convention of North Carolina. The materials are currently held by UNC Libraries. To learn more, visit UNC’s partner page or Shaw University’s website.